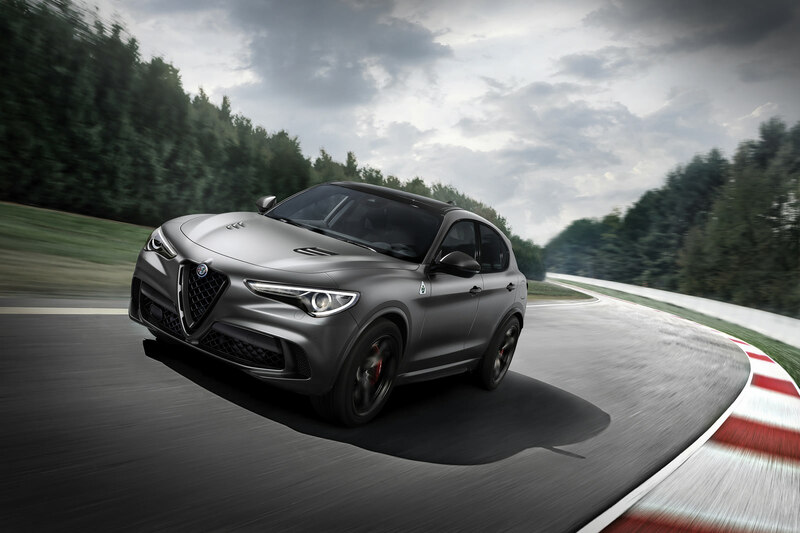 The Alfa Romeo Giulia and Stelvio Quadrifoglio models are getting special NRING variants to celebrate their record-setting Nurburgring lap times. Both special edition vehicles will be on display at the 2018 Geneva Motor Show, featuring standard equipment such as carbon-ceramic brakes, Sparco racing seats with red stitching and carbon shell structure, Mopar automatic transmission knob with carbon insert, leather, and Alcantara steering wheel, also with carbon inserts. The numbered badge in the carbon fiber dash insert and the unique Circuito Grey paint will be exclusive to the limited edition models. Other minor exterior upgrades include a carbon fiber front badge and rearview mirror caps. The NRING models will also come standard with tinted windows, active cruise control, the Harmon Kardon premium audio package, and the Alfa Connect 3D Nav infotainment system with 8.8-inch screen, Apple CarPlay, Android Auto, and DAB. Inside the cabin, there are also mats with red logos developed by Mopar. Meanwhile, the Alfa Romeo Giulia Quadrifoglio NRING premieres a bare carbon roof. what is the Alpha Connect 3D nav system, is that different from the regular one? its the new name of the new, more equipped magneti marelli infortainment. alfa romeo stelvio quadrifoglio nurburgring limited edition number eighty seven of one hundred and eight. Any suggestions on the order process? I'm looking to get in on this model. If you've got a dealer let me know. Thanks. As long as they don't put that whole badge on the tailgate. Curious to see the red logo'd floor mats and if they come available to order. youtube it at the geneva show, not much red on the mats but better than plain black. I prefer most standards colors to the matte finish, but they only need 108 people who prefer this. I doubt US dealers have any info on it yet, but pm sent psherwin1. I like the red center console trim, which I don't think comes on the quad red interior. I may have to special order those pieces.